If you want to improve the UX of the person reading your resume, check out this sample. Judicious editing helps produce a compelling, one-page resume. If you want to improve the user experience of the person reading your resume, check out this sample for an experienced UX designer below. Judicious editing can help produce a compelling, one-page resume, says resume expert Kim Isaacs. 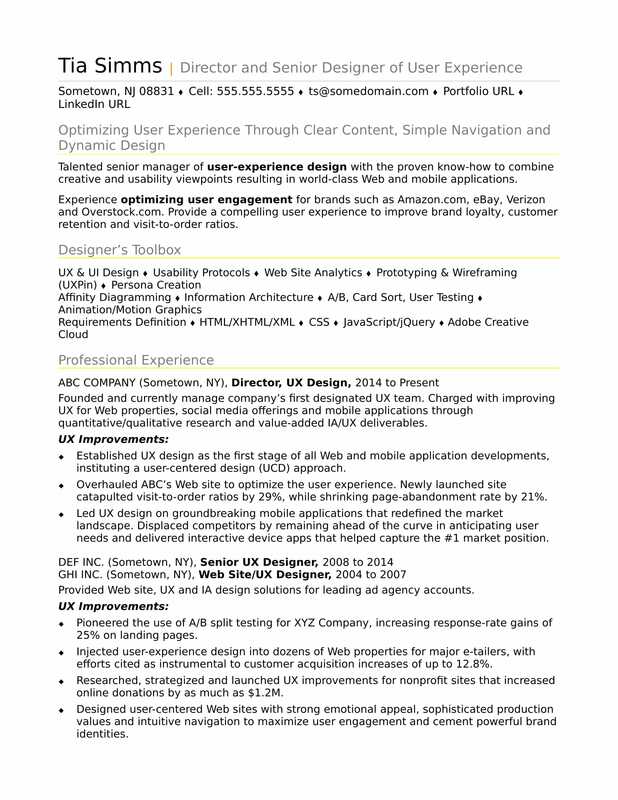 View the sample resume she created below, and download the experienced UX designer resume template in Word. And if you need more help, let the experts at Monster's Resume Writing Service create a high-impact resume for you that will impress employers. Jobs for UX designers are projected to grow by 15% (Or 24,400 jobs) from 2016 through 2026, according to the Bureau of Labor Statistics (BLS). You’ll find the highest level of employment for this job in the following states: California, New York, Texas, Florida, and Washington; and in the following metropolitan areas: New York City, Los Angeles, Seattle, Chicago, and San Francisco. As a UX designer, you can expect to make a median wage of $67,990 per year, or $32.69 per hour, according to the BLS. Additionally, you can find UX designer jobs on Monster. Talented senior manager of user-experience design with the proven know-how to combine creative and usability viewpoints resulting in world-class Web and mobile applications. Experience optimizing user engagement for brands such as Amazon.com, eBay, Verizon and Overstock.com. Provide a compelling user experience to improve brand loyalty, customer retention and visit-to-order ratios. Founded and currently manage telecom company’s first designated UX team, building an A-caliber group of interaction designers and user-experience researchers. Charged with improving UX for Web properties, social media offerings and mobile applications through quantitative/qualitative research and value-added IA/UX deliverables. Established UX design as the first stage of all Web and mobile application developments, instituting a user-centered design (UCD) approach. Overhauled ABC’s Web site to optimize the user experience. Newly launched site catapulted visit-to-lead and visit-to-order ratios, while shrinking page-abandonment rate by 21%. Led UX design on ground-breaking mobile applications that redefined the market landscape. Displaced competitors by remaining ahead of the curve in anticipating user needs; delivered interactive device apps that helped capture the #1 market position. Provided Web site, UX and IA design solutions for diverse industry client accounts of leading ad agencies. Pioneered the use of A/B split testing for XYZ Company, facilitating response-rate gains of 25% on banner ads and landing pages. Injected user-experience design into dozens of Web properties for major e-tailers (including EFG Company and HIJ Company), with efforts cited as instrumental to customer acquisition increases of up to 12.8%. Researched, strategized and launched UX improvements for nonprofit sites that increased online donations by as much as $1.2M. Designed high-impact, user-centered Web sites with strong emotional appeal, sophisticated production values and intuitive navigation to maximize user engagement and cement powerful brand identities.